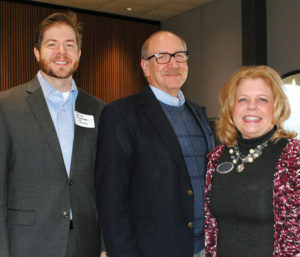 There were smiles aplenty when League City Mayor Pat Hallisey and his wife, Janice, center, arrived at the Johnnie Aroflo Civic Center for the League City Chamber luncheon. Among those greeting them were, from left, realtor Kimberly Harding, Kevin Murphy and Congressman Randy Weber and his wife, Brenda. League City Chamber members got an update by Galveston County Judge Mark Henry at their State of the County Luncheon – learning about the status of several county projects in addition to offering advice for Hurricane Harvey flood victims. Knowing that Harvey was foremost on everyone’s minds, he agreed with their thinking: “I’m aggravated (over the lack of action). Things are going way too slow,” he said of the delays many of the county’s 20,000 flood victims have been facing. But he had some good news about a state program run by the General Land Office that has been a big help to some victims. It’s called Partial Repair and Essential Power for Sheltering Program or PREPS. It provides basic repairs up to $20,000 and allows homemakers to remain in their homes while the work is done – usually in about two days. Already PREPS has finished repairs to 20 homes in Galveston County with another 6,820 eligible for the program the GLO is attempting to reach. The GLO has made more than 60,000 phone calls and 30,000 phone calls to victims registered with FEMA about the program. Judge Henry said he had learned that many recipients think it’s a hoax and don’t respond. He also suggested that victims visit www.TexasRebuilds.com and www.galvestoncountyrecovers.com for information. Boeing’s Brian Freedman, from left, and his dad, Glenn Freedman, stop to talk with florist Teresa Vencil at the League City Chamber State of the County Luncheon. Another was the 64-acre Bayside Regional Park in Bacliff and community center for seniors. But while many were glad to get some good Harvey tips, they all were happy to see Mayor Pat Hallisey arrive after nearly losing his life to a heart attack several weeks back and having to have his lower leg amputated. 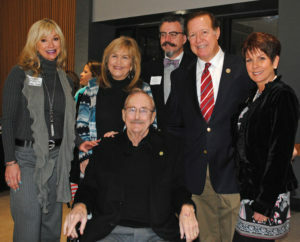 He and his wife, Janice, were all smiles as Chamber President Steve Paterson, Congressman Randy Weber and his wife, Brenda, Galveston County District Attorney Jack Roady, former County Commissioner Ryan Dennard and a number of city officials welcomed him to the Civic Center. Bay Area Houston Ballet & Theatre dancers Meaghan Abel, Jenna Westall, Rachel Stonestreet, and Hannah Young entertain the crowd at the Bay Area Go Texan Rodeo Style Show. “BEST ONE YET!” That was the reply of a Clear Lake cowboy when asked his opinion of the Bay Area Go Texan Rodeo Style Show, which seems to get better and better as the years roll by. And, and it also was a comment Capt. Dianna Jones and Asst. Capt. 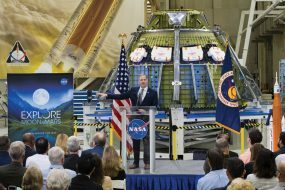 Anita White heard over and over Friday, Jan. 19 after they welcomed the lively crowd of cowboys and cowgirls to NASA’s Gilruth Center and invited them to come right in and join the fun. Walking in, you probably would have bumped into Rocky Mauldin, Gene Hollier, Emmeline Dodd, Nancy Buffaloe, Anita Fogtman, Irene Pavig, Annette Snow Falks, David Robertson or Don Billings before you went very far. They never miss it. Emcee Phil Pampolina got the crowd rocking after introducing the dignitaries and donors and giving everyone a chance to bid in the live auction. Then came the style show, which had a “Fire and Ice” theme highlighted by a great performance by the Bay Area Houston Ballet & Theatre dancers and directed by fashion guru Lenny Matuszewski. Models included Miss Texas USA Nancy Gonzalez, Webster Fire Chief Patrick Shipp, Nassau Bay City Manager Jason Reynolds and former Mrs. Galveston County, Kelly Williams of Kemah. Model, Lily Heintz, shows off an evening gown during the Bay Area Go Texan Rodeo Style Show. Joining them in showing off a variety of fashions from Adelaide’s Boutique, Casanova’s Downfall, Cavender’s Boot City, Dillard’s Baybrook, Jill’s Fashion and Bridal, Kendra Scott-Baybrook Mall and The Clotheshorse were Bobby Osoria, Shari Sweeney, Karen Jordan, Lily Hentz, Jimmy Molina, Anna Babineaux, Moni Trevathan, Molly Culbreth and John Bartee. Others coming down the runway included Kellie Gross, Bo Rogers, Amy Bowlin, Dafne Sanchez, Ashley Reed, Jeremiah Corbin, Leah Galindo, Kelly Gurgos, Sarah Elliott, Jamie Sausser, TL Sellers, Karen Beaty, Karla Boddie, Jamie Sausser, Misty Hajecate, Ashley Reed, Nancy Buffaloe and Liz Cantu. And, after a delish luncheon provided by Grazia Italian Kitchen, many stopped to thank the hard-working committee, who had put together another winner for all to enjoy. 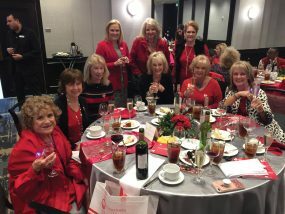 Committee members include Deane Beck, Darla Billings, Amber Blake, Sunnie Byerly, who was named Committee Person of the Year, Ronda Cook, Renee Daigle, Robert Engler, Lesa Martin Gaffey, David Gambino, William Greer, Angela Guidry, Lisa Gurgos, Deborah Gutierrez, Tory Jenkins, Sandra Kay Kelly, Heather Kirk, Becki Leal and Alice Lyons. Plus, Ange Mertens, Marish Morgan, Sabana Nathoo, Alan Rice, Elena Richards, Shelley Rogers, Donna Rone, Keith Satterwhite, Melis Sausser, Debra Stokes, Elizabeth Taylor West, Chiquita Taylor, Irene Taylor, Robert Mike Taylor, Marisa Vannoort, Michelle Walker, Sharon Werner, Darice Whatley and Janice Williams.